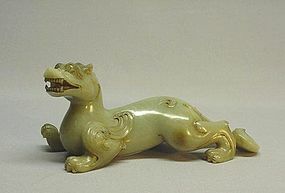 This 19th century jade (nephrite) carving of PiXiu is 8” long, 3 ¾” high and 3” wide. PiXiu is a Chinese mythical creature who is considered to be a very powerful protector regarding the practice of Feng Shui. Not only it can protect an individual or a family, it will also draw wealth from all directions. PiXiu resembles a winged lion and is the ninth offspring of a dragon. It has a pair of bulging eyes, a long, bushy tail and one curly horn (some have two horns). This carving is perfect in proportion and form. It is in excellent condition.